The Saturday Evening Post March/April 2016 cover features the beautiful Yellowstone National Park design. It is believed to be the work of C. Don Powell, chief designer for the WPA-FAP poster program, which was suspended at the start of World War II. Created in the mid-1930s in response to the Great Depression, the Works Progress Administration (WPA) and its Federal Art Project (FAP) employed more than 5,000 artists who created 225,000 works of art for the American people. From 1938 to 1941, the National Park Service employed WPA-FAP artists to create silk-screen promotional posters for national parks. Only 14 designs were created before the project was suspended with the onset of World War II. Of the 14 parks posters produced, few survived — until Doug Leen, a former park ranger, happened upon one at Grand Teton National Park in the early 1970s. Fascinated with the artwork and the history behind it, Leen embarked on a mission to find, restore, and eventually reproduce the vintage NPS posters. (For more on Leen and his quest, visit rangerdoug.com.) 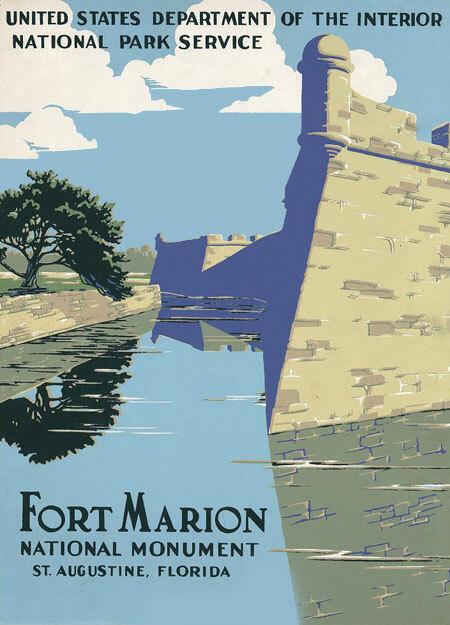 Just over 40 of these rare, original national park posters have since resurfaced and are now in National Park archives, the Library of Congress, and with private collectors. Relatively little is known about the individual artists who created the national park designs; the posters do not bear any artist’s signatures. Yet a National Park Service informational display produced in 1939 contains several photographs of one artist in particular, later identified as C. (Chester) Don Powell. Born in 1896, Powell grew up in Kansas but studied art in Chicago where he also did commercial work for companies such as Wurlitzer. In 1927, Powell and his wife moved to San Francisco, where he set up a studio until the stock market crash of 1929. Out of work as an artist, he went to work for the WPA, first as a flagman on a road crew. But when his creative talents came to light, Powell was transferred to the National Park Service. Powell is believed to be the primary artist for the Yosemite, Yellowstone, and Zion serigraphs. The poster project was closed down in 1941, with the onset of Word War II. When his assignment for NPS ended, Powell took a course in marine drafting and went to work as a modeler at Kaiser Shipyards in nearby Richmond, California. After World War II, Powell taught Adult Education courses in silk screening for Oakland City Schools and continued to pick up freelance jobs. His post-war work was mostly architectural — designing churches, schools, gymnasia, and houses — although he also did sign making, magazine and book illustration, set design, painting restoration, and commercial artwork. The last nine years of his life were spent as a draftsman with the 6th Army Engineers. He died virtually penniless in 1964 and is buried in Hayward, California. WPA-FAP artists created 14 original designs between 1938 and 1941 for these 13 national parks — Fort Marion (now known as Castillo de San Marcos), Glacier, Grand Canyon, Grand Teton, Great Smoky Mountains, Lassen, Mount Rainier, Petrified Forest, Wind Cave, Yellowstone (2 designs: Old Faithful and Yellowstone Falls), Yosemite, and Zion. Click the gallery images below to expand. C. Don Powell at his desk working on a WPA poster. Don Powell is my maternal grandfather. It is nice to read in this and other articles his achievements being recognized. The article mentions he did near broke. He may have been poor $ wise but he was rich in other measures – 3 children, a loving wife, and a reputation for being kind and willing to help. Of his 3 children, 2 are still alive, his older daughter (my mom) and his younger daughter. My mom tells stories of his willingness to help others, even when he had hardly any funds. He built a beautiful playhouse for his children – I have seen the picture of it in my mom’s house. If anyone has memories of Don and Selma Powell, I would love to hear them.